BRADENTON May 28, 2017 -Today, members of Manatee County Search and Rescue were honored by Bullard Emergency Responder and inducted into their Save A Life Club. This award is given to an agency or agency member that has used a Bullard Thermal Imaging Camera in a way that assisted in saving a life. Manatee County Search and Rescue is the first stand alone search and rescue agency in the country to be a recipient of this prestigious honor. The members were presented their plaques this morning at the Manatee County Board of County Commissioners meeting by Bullard Corporation representative Rob Healy and were joined by Lieutenant Davis of the St. Petersburg Police Department. Lt. Davis requested the team back in May of this year to assist in locating a missing autistic child and brought him home safely. The team wants to extend their deepest thanks to Mr. Healy, Bullard , Lieutenant Davis and the St Petersburg Police Department for the opportunity to help the community. They would also like to thank the Firehouse Subs Public Safety Foundation for their generous grant that allowed the team to purchase the two Bullard Thermal Imaging Cameras that were used in this search. It is with the assistance of people like you that the team is able to continue to do the job they do and appreciate the support of their efforts. Manatee County Search & Rescue has partnered with National Center for K-9 Training to bring the first K-9 Training Seminar. Two programs will be featured and students can choose either Tracking/Trailing OR Human Remains Detection. The seminar is open to Law Enforcement and Civilian Search & Rescue K-9 Handlers. Both courses of instruction will have an emphasis on the integration of civilian resources with law enforcement officers to develop understand and to ensure the smooth integration of the two entities when partnered on a search together. CONGRATULATIONS to MCSAR's own Tim Hillman who won First Place in the EMT portion of the First Responder Challenge! The competition was held on Saturday November 16th at Manatee Technical Institutes East Campus. Tim, who is a Firefighter/EMT, also stepped up and competed in the Law Enforcement Challenge! OUTSTANDING JOB TIM! Community members watch fire fighters, law enforcement and EMS showcase their prowess durning the First Responders Challenge as they compete for bragging rights as the most skilled among their peers. This family-friendly event, also includes demonstrations such as Bay Flight, Canine Unit, Search & Rescue Canine Unit, as well as an emergency extrication team. IamResponding.com (www.iamresponding.com) is a web-based system which saves critical time for Manatee County Search & Rescue when responding to emergencies. After receiving a dispatch notification, MCSAR responders speed dial one number on their phone. Responders are immediately connected to an automated telephone system for a call that lasts only seconds. On one simple computer screen (accessed through any computer with internet access), MCSAR team leaders and dispatchers immediately see who is responding, their level of certification/qualification, the time that they are responding, and where they are responding (station or scene). No one needs to answer any telephone or radio calls from any responders, and no software had to be purchased or installed. 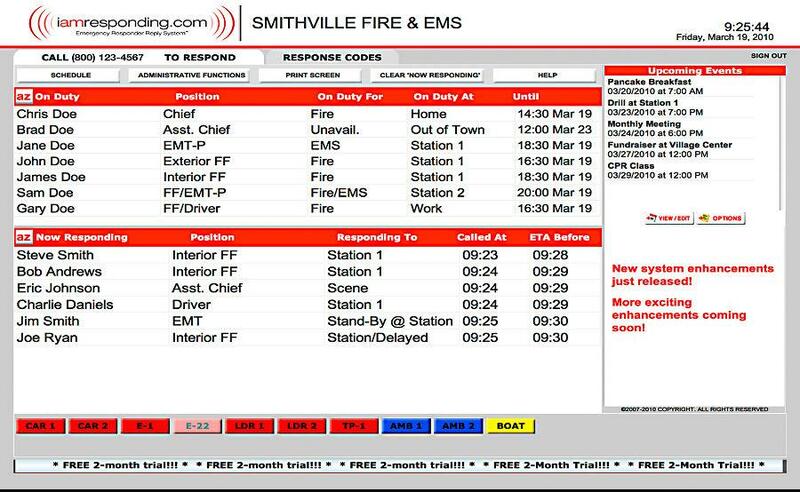 With IamResponding.com, no more time is wasted waiting for members who are not responding, reactivations are issued much sooner when not enough responders are en route to the station or scene, and response times are significantly reduced. MANATEE COUNTY, Florida [NMT] -- The Manatee County Sheriff's Office reported a missing juvenile on Sunday, August 4th, at about 6 p.m., in the woods surrounding the Sheriff's Youth Ranch, 751 Rye Wilderness Trail, in East Manatee County. A sheriff's report said Jordan Luckett, 16, went outside to do his assigned chores at approximately 6 p.m. and was seen running into the woods. The other juveniles and staff looked for him but could not find him. They then notified MSO, advising he may be lost in the woods. The juvenile is not from this county and has no family or friends in the area. The surrounding area was then searched by several deputies with negative results. The aviation unit, blood hounds, and the Manatee Search and Rescue team were paged out to assist. Upon their arrival, Luckett was found near the fire station located at 150 Rye Rd. Before being swept away by a current, 6-year-old Lamontea Taylor saved the life of another child who was swimming with him. Lamontea Taylor, whose body was found by searchers around 10 a.m. Monday in the Gulf of Mexico off Anna Maria Island, helped prevent a 5-year-old girl named Natallie from drowning, the girl's mother said. "My daughter was swimming with him in the beach, and he went under and pushed her up and saved her life," Amanda Jones said. "She told me she couldn't breathe, and Lamontea pushed her up. That was the last anyone seen of him." Lamontea, a student at Bradenton's Samoset Elementary School, went missing in the waters of Longboat Pass around 6:30 p.m. Saturday. Personnel from multiple agencies, including the Coast Guard, searched for him Saturday night and Sunday. His body was found by two Florida Fish and Wildlife officers Monday and brought to shore. Bradenton Beach police are investigating the case as a drowning. Natallie Porter, the little girl, was treated at a local hospital Saturday evening. "She was traumatized," Jones said. "She was in shock, but she is OK. He's our hero and we'll always remember him as our hero we are forever grateful." The outcome for Natalie apparently could have been much worse if not for Lamontea's actions. Authorities said Lamontea was with his family until he got caught in a rip current and swept out to sea. Signs prohibit swimming in the area because of strong currents. "You have a terrible terrible example of what happens when you get too close and you go in go in the water where there is no swimming. And get caught in current and a lot of things can happen. This is again a tragedy because a young life has been lost now," said Lenard Diaz, Detective Seargent with the Bradenton Beach Police Department. The boy’s mother, Laketa Taylor, was too devastated to talk to Bay News 9 Monday. Though she did say thank you to everyone who helped with the search. Detectives with the Bradenton Beach Police Department say the boy's parents do not face any criminal charges, and are calling what happened an accident. Funeral arrangements have not been made at this time, however the family is asking for help to pay for it when they do.